Leaf is proud to bring to the hobby an exciting addition to out industry leading hockey product portfolio with 2017-18 Leaf Hockey! Look for an exciting mix of nostalgic designs and new content! 1948 Leaf – A single player memorabilia set featured on the iconic 1948 Leaf design and featuring legends from the early part of hockey history! Such as George Vezina, Cyclone Taylor & Percy LeSueur. 1960 Leaf – A single player memorabilia set utilizing the 1960 Leaf design and featuring legends from that era! Such as: Gordie Howe, Maurice Richard & Jean Beliveau! 1990 Leaf Autograph – Single player signature card featuring the iconic 1990 Leaf Baseball design! Look for signatures of superstars from that era such as: Mario Lemieux, Sergei Fedorov & Brett Hull! 1990 Leaf Memorabilia – A single player memorabilia card featuring the iconic 1990 Leaf Baseball design! 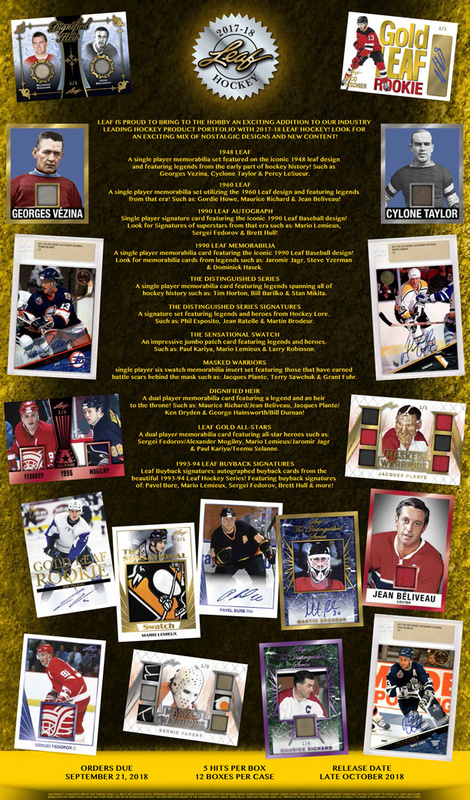 Look for memorabilia cards from legends such as: Jaromir Jagr, Steve Yzerman & Dominick Hasek. The Distinguished Series – A single player memorabilia card featuring legends spanning all of hockey history such as: Tim Horton, Bill Barilko & Stan Mikita. The Distinguished Series Signatures – A signature set featuring legends and heroes from hockey lore. Such as: Phil Esposito, Jean Ratelle & Martin Brodeur. The Sensational Swatch – An impressive jumbo patch card featuring legends and heroes. Such as: Paul Kariya, Mario Lemieux & Larry Robinson. Masked Warriors – Single player six swatch memorabilia insert set featuring those that have earned battle scars behind the mask such as: Jacques Plante, Terry Sawchuk & Grant Fuhr. Dignified Heir – A dual player memorabilia card featuring a legend and an heir to the throne! Such as: Maurice Richard/Jean Beliveau, Jacques Plante/Ken Dryden & George Hainsworth/Bill Durnan! Leaf Gold All-Stars – A dual player memorabilia card featuring all-star heroes such as: Sergei Fedorov/Alexander Mogilny, Mario Lemieux/Jaromir Jagr & Paul Kariya/Teemu Selanne. 1993-94 Leaf Buyback Signatures – Autographed buyback cards from the beautiful 1993-94 Leaf Hockey Series! Featuring buyback signatures of: Pavel Bure, Mario Lemieux, Sergei Fedorov, Brett Hull & more! Each box contains 5 hits.